When complex emergencies like Typhoon Haiyan occur, Esri’s Disaster Relief Program (DRP) provides direct support to the organizations and agencies charged with handling these exceptional situations. The impetus to create the DRP came on September 11, 2001, when terrorists commandeered two airliners and destroyed the World Trade Center’s twin towers. New York City’s state-of-the-art Emergency Operations Center (EOC) was also wiped out in the ensuing inferno. Computers, data, software—the EOC’s entire infrastructure, including the ArcGIS software it relied on for emergency response and recovery—were lost in an instant. Esri and other organizations quickly responded to the city’s call for help. A temporary EOC was set up on Pier 92 on the Hudson River in Manhattan, and regional Esri staff members began providing critical software licenses, personnel, and data to support New York’s mapping needs. At Esri’s headquarters in Redlands, California, the technical support staff worked around the clock to fulfill the growing number of mapping requests. The DRP has provided support for a number of recent, high-profile emergencies, including the downing of Malaysia Airlines flight MH17 over Ukraine in July 2014. The attack took place on the final day of the Esri User Conference in San Diego, California, and conference attendees from Malaysia’s Department of Survey and Mapping quickly joined Esri specialists and key partners to form a team of multidisciplinary geospatial experts. They gathered in a meeting room at a local hotel where the DRP had set up a temporary operations center. The assembled team rapidly established a website that provided the Malaysian Armed Forces with access to a common operating picture that included detailed maps and demographics for Ukraine. Among other requests for assistance, the DRP provided the Armed Forces of the Philippines (AFP) with mapping support for their recovery efforts from the destruction caused by Typhoon Haiyan in 2013. Later, the team donated an ArcGIS Online organizational license to the AFP to assist in the agency’s extensive security preparations for the APEC Economic Leaders’ Meeting in Manila in 2015. 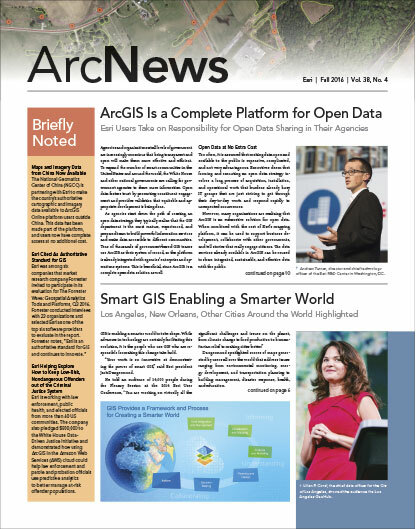 This prompted a reorganization of Esri’s response programs. Both the DRP and SEMP now fall under the newly established Esri Public Safety Assistance Program (EPSAP). The EPSAP was recently on alert to provide mapping support for the 2016 Democratic and Republican National Conventions in the United States. To receive assistance, an agency or organization first needs to fill out a request form on the DRP website. The DRP team then receives an automatic notification that a request has been filed. For more information about the Esri Disaster Response Program or to request assistance, visit the DRP website. It contains resources such as public information maps, examples of disaster response and recovery methodology, web map templates, how-to guides, live-feed data, social media feeds, case studies, and videos.